Revisiting places with your new journal in hand. Above: The fish sign at the bait shop in Grand Marais Minnesota. From my 2003 travel journal for this trip. Summer has me still thinking about travel journals. 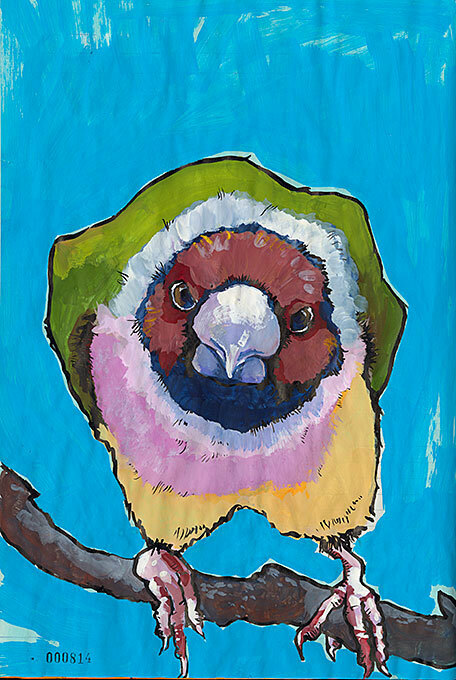 One of the great benefits of a life-long journal habit is that you often return to places and those places then get captured over and over in your journals. Time lends perspective to each new visit. You can look back over time and see more than changing art materials and visual approaches. You see how friendships change and develop, how time changes a place (the buildings, the roads, the traffic, the fashions, you name it). In 2003 I went to Grand Marais with a friend and stayed with her and her family at their cabin on Lake Superior. You can see that 2003 Grand Marais Journal on my website. 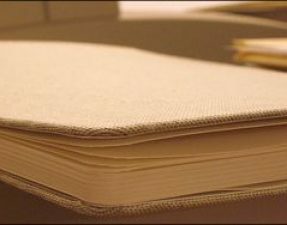 You can also see my journal of Grand Marais from a 2005 trip. Left: A 2005 visit to the Beaver House in Grand Marais, MN, from a 6 x 8 inch (approx.) journal I made with Gutenberg. When I returned to Grand Marais in 2005 I was busy working with the Pentel Color Brush (even though it was not lightfast—I liked the watersoluble nature of it). 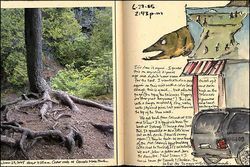 In 2007 I returned to Grand Marais to teach a week-long bookmaking and nature journaling workshop. The focus of that journal shows the work aspects of the trip. But there are also many pages (not published) which deal with my growing friendship with my host family, and the adventures we had. I've been back to Grand Marais at other times, for shorter trips. On those trips I didn't take a special journal, but worked in a regular journal, knowing I wouldn't fill the entire book in the few days I was gone. 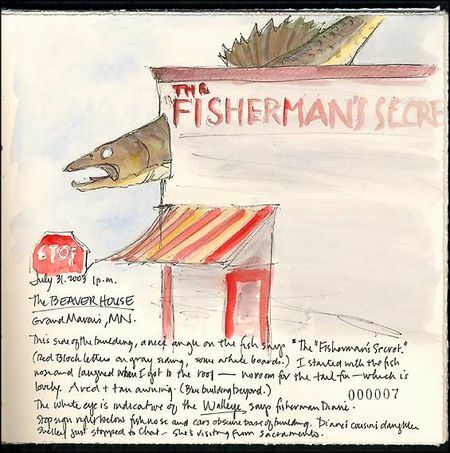 (See four pages, starting with this image, from a quick 2006 trip to Grand Marais, kept in one of my regular journals.) Those pages too have much to tell me about a part of Minnesota that I have fallen in love with. But the journals also tell me about myself, my changing attitudes and interests. We grow, we look deeper, we search for what we haven't seen before, or we look closer at what we took for granted. Our response to a place we have visited before can tell us much about our development emotionally, physically, even spiritually. Take some time this week, whether or not you can go on a trip, to look at your world with a fresh eye. Find those things that you are always sketching in your journals. Find those things you avoid sketching and ask why (too painful to look at, too difficult to contemplate, too critical of your drawing skills). Make a conscious effort to really look at something you take for granted. Discover those subjects you loved sketching and thinking about, but which now have no place in your life (or your journal). Do you want them back? How can you make room for them in your life? And also, plan a trip to a place you've been before—some place close and inexpensive (so it doesn't shock your system or your wallet). Make it short so you don't tax your endurance. Look at what you find on this return visit with a fresh eye of wonder and inquisitiveness. I grew up as a third culture kid. I was always going back to places where I had lived for only a year or so. I always had a fresh view of a place—in fact I had to work actively to get beyond the surface, as I knew my time was always short. 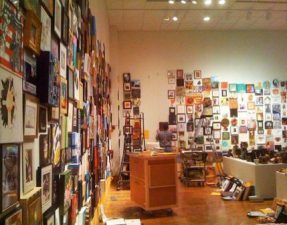 Return visits don't have to be about maudlin nostalgia and regret—return visits can confirm your suspicions of trends, your intuition about people, your insight into things economic and political. Return visits can be about touching some forgotten artistic passion you had for plants, or landscapes, or buildings. Return visits give you an opportunity to register what you have been given and have learned. Return visits provide an opportunity to be grateful for who you are becoming—or the sense to work on that.